For the past is our present, a defining British characteristic. Norman castles and Gothic cathedrals, gabled Tudor edifices, Queen Anne manor houses, and strikingly elegant neo-classical country houses never cease to inspire awe; how proud we are, too, to live in our highly sought-after Victorian family villas. The architectural heritage trail does not include many stops at ‘modern’ establishments, such as the Shard, Turner Contemporary, Tate St Ives, brutalist housing estates, or homes reminiscent of Ernö Goldfinger’s Willow Road. In order to reveal the diverse nature of architecture built within the last one hundred years, educate and enlighten, the Twentieth Century Society coordinated a project called 100 Buildings 100 Years, the results of which have been published by Batsford. Members and supporters of the Society were asked to nominate buildings that were designed and came into use during the last 100 years: buildings with which they feel a particular ‘connection’ or which they find intriguing or inspiring. I wish I could have been the fly on the wall when the selections for each of the years were made; I’m slightly bewildered as to how the final list was compiled. To coincide with the book’s publication, the Society organised an exhibition at the Royal Academy (11 October 2014 – 1 February 2015) showcasing the structures in the book. Both book and exhibition reflect the Society’s ‘pluralistic’ rather than partisan perspective. It steadfastly champions the conservation, preservation and listing of not only the modern, but the ‘Modernistic’, ‘Classical’, ‘Neo-Georgian’, ‘Pseudish’ (a term referred to by Gavin Stamp with reference to its creator, Osbert Lancaster: ‘a particularly clever name for that white-walled sub–Spanish Colonial manner with bright green or turquoise pantiles on the roof’), ‘Gothic’, and even ‘Stockbrokers’ Tudor’ (another Lancaster term). The Society also recognises, as former chair Alan Powers explains, the social, that is to say, ‘the use value of buildings, public spaces and landscapes, rather than merely their architectural and historic importance’. The Society was christened The Thirties Society. ‘It had good ring to it,’ says Powers, its first caseworker in 1981. ‘People were apt to enquire whether it was a dating organisation for “thirty somethings” and perhaps it was occasionally’. One can’t help avoid the feeling that the title wasn’t an easy one to choose. Maybe it seemed a good idea at the time, over a glass or two, as it would relate to the period the group concentrated on initially, though in reality it wasn’t long before the Society endeavoured to protect ‘younger’ architecture and design. In 1992, the name change occurred. Listed buildings (in England) are buildings and structures such as bridges, monuments, sculptures, war memorials and telephone boxes which the Secretary of State of Culture, Media and Sport considers to be of special architectural interest (in design, craftsmanship, decoration, or technological innovation) or historic interest (i.e. because of what the structure reveals about the nation’s social, cultural, economic, military or environmental background). Depending on the structure’s location, applications for new entries or to amend or upgrade a listing are made to Historic England, The Historic Environment Service of the Welsh Government, Historic Scotland, or the Northern Ireland Environment Agency. These organisations consider the merits of the applications and make recommendations to the Secretary of State. There are c.380,000 listed buildings in England (315 post-war). Grade I are of exceptional interest (2.5%); Grade II* are particularly important structures of more than special interest, (5.5%); Grade II are of special interest (92%). Buildings less than 30 years old are rarely listed and buildings less than ten years old are only listed if they are of exceptional quality and under threat. In 1987, the classical Bracken House (1959, Albert Richardson) became the first post war building to be listed. Being listed does not ensure that a building will not be demolished. Listed building consent must be obtained from the local planning authority if alterations are proposed. For more information about the Twentieth Century Society, please visit http://www.c20society.org.uk/. See also articles about the Barbican and Ernö Goldfinger’s Willow Road in Artistic Miscellany. 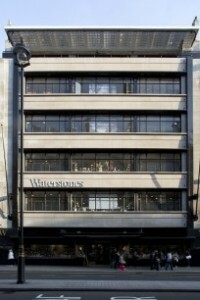 The photograph is of Simpson’s Piccadilly (now Waterstones), designed by Joseph Emberton, 1936. It is listed Grade II*, ©Twentieth Century Society. This article first appeared in Cassone: The International online Magazine of Art and Art Books in the October 2015 issue.